Machine is very easy to use and needs to be picked up by the base. Please do not lift by sides, they are glass. When laying out your area the unit should be in the shade to keep the crushed ice longer. 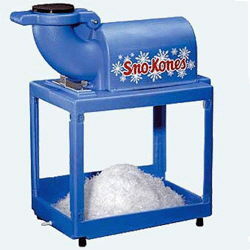 * Please call us for any questions on our snowcone machine rentals in New Britain PA, serving the Greater Philadelphia area.